There are lots of different approaches to community consultation and engagement. Genuine consultation and engagement is essential to ensure that a project or activity meets the needs of those it is designed to help. Effective engagement can make a real difference to the success of a project. 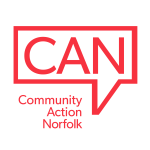 Community Action Norfolk can help you to prepare and manage engagement events and activities tailored to your needs. Our staff have considerable experience as well as access to a range of tools and resources to help run successful engagement programmes. If you would like help with consultation and engagement in your community, please get in touch.